Green, unroasted coffee beans are porous and absorbent. As anyone in the industry knows from painful experience, green beans easily pick up odors from almost anything in their environment — paints stenciled on coffee bags, for example, concrete floors, petroleum residue in shipping containers, cardamom stored in the same warehouse. But where there is a problem there also may be an opportunity. This is 2017, after all, a time of disruption and innovation in every field, including coffee. What if you deliberately exposed those vulnerable, open-pored green beans to other odors, odors our culture generally considers appealing rather than offensive? Natural aromas, such as the residual odors in wine or whiskey casks, for example? Or roasted cacao? Or flowers — coffee flowers in particular? All of the above possibilities figure in this month’s report. We tested 17 coffees that were shut inside empty whiskey barrels for anywhere from six to 24 weeks before roasting (10 of them inside bourbon barrels, two inside rye whiskey barrels, one inside a Scotch whisky barrel, and four inside unspecified whiskey barrels, probably bourbon). We also tested five coffees that had been shut inside wine barrels and two inside rum barrels, plus one stored with fermented and roasted cacao and another infused with dried coffee flowers. We also tested two Indonesia coffees that were conventionally aged, in this case simply stored in burlap bags inside clean, ventilated warehouses in Singapore for three years. The general scope for this report was coffee deliberately exposed to a variety of flavor-altering but natural processes while still in its unroasted, green state. We hoped to source samples not only reflecting the relatively new and fashionable practice of conditioning green coffees inside wine or spirits casks, but also samples of coffees treated by traditional practices like aging and monsooning (the practice of exposing coffees to moist monsoon winds in special warehouses for three to four months on the southeastern coast of India). As it turned out, we did not manage to source any monsooned coffees, but one of the two conventionally aged coffees we tested, the Equator Aged Sumatra Ulos Batak Peaberry (94), shared honors as one of the two highest-rated coffees in this month’s report. Coffees typically turn rather flat and woody after three years in special aging warehouses, saved perhaps by some musty notes that suggest spice or tobacco. But this particular aged Sumatra, apparently a spectacular coffee to begin with in the new, refined Sumatra wet-hulled style, appeared to maintain its twisty, sweet-savory-zesty character brilliantly, while accruing depth and resonance from the aging. Note that in the case of this Sumatra, the process applied to the green beans after curing did not turn an ordinary coffee brilliant; rather, it gave an already brilliant coffee further nuance and differentiation. This leads to a more general observation. It appeared to us that, regardless of what was done to a coffee, the better and more distinctive the coffee was when it went into the cask or conditioning process, the better and more distinctive it was when it came out. Generally, strong-charactered single-origin coffees fared better in casks than did the blends, anonymous Arabicas or quiet Brazils that many roasters appear to have started with. 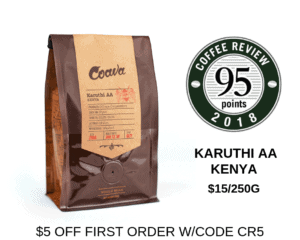 For example, I suspect that the Modern Times Bourbon Barrel-Aged Kenya Baragu, at 94 the highest-rated cask-conditioned coffee we tested, was already a big, complex coffee when it went into the bourbon barrel for 65 days of conditioning. Certainly the whiskey notes, however pronounced, did not completely overwhelm the coffee, and, presumably worked on by the fruit notes in the coffee, read more as, say, wine or brandy than an American whiskey. On the other hand, how much the final complexly fruit-toned and lavender-scented profile owed to the impact of the whiskey-conditioning and how much to a big, crisply fruit- and floral-toned Kenya to start with is difficult to even guess at. There was simply a lot of intense sensory excitement, and all of it, in our judgment, pleasurable. We found we had to put aside some of our linguistic and ideological coffee-related preconceptions, face an invigorating sensory experience with open mind and palate, and say, well, I think this is good. How good? Long, meandering discussions and repeated tastings later, we went for 94 points good. Wine Casks or Whiskey Casks? Another possible (very tentative) generalization arising from our tasting might be that wine-casking is less aggressive and risky than whiskey-casking. This month’s third-highest-rated sample, the Water Avenue Pinot Noir Aged El Salvador (93) showed a subtler impact from the casking than did any of the whiskey-casked coffees. The profile appeared to reflect both the dry fruit tendencies of a likely Bourbon-variety coffee from El Salvador as well as the oak and wine-related tones that might be plausibly associated with the casking. Here one might say that there was something close to a coherent dialogue or balancing between the impact of cask and coffee. Water Avenue Coffee ages an El Salvador honey-processed coffee in a Pinot Noir barrel. Courtesy of Water Avenue Coffee. It appears that conditioning in whiskey rather than wine casks risks overwhelming green coffees that do not start with enough character to push back and force a collaboration with the whiskey in some complex or exciting way. Most of the bourbon-casked samples were heavily dominated by the whiskey. Some rather pleasantly so, others less pleasantly so. But either way the whiskey influence seems to have exerted at least some numbing impact on the contribution of the often-anonymous green coffees. Particularly in darker roasted samples, the combination of dark roasting and whiskey-casking netted a forceful but heavy, inexpressive cup. There were exceptions, however. With the Revel Barrel Proof Coffee (92), the alcohol contribution dominated, but owing to a lightish-medium roast and perhaps to a more nimble-footed contribution from the whiskey (the conditioning was carried out in a rye rather than a bourbon barrel) this sample remained sweet, nuanced and lively. The alcohol element struck us as more grappa-like than whiskey-like, again, perhaps owing to a felicitous collaboration with the fruit notes in the coffee (a blend of Brazil, Kenya and Guatemala). We still could have dissed this sample for lacking certain clearly readable coffee characteristics (the acidity, for example, was virtually impossible to describe in coffee terms), but the animated alcohol-toned fruit, buoyant mouthfeel and delicate nuance persuaded us to support it with a 92. The Reprise Barrel-Aged Coffee (92) represented a distinguished Nicaragua coffee conditioned in a Jamaica rum barrel that had seen previous service as a Jack Daniel’s Tennessee whiskey barrel. Possibly the most balanced and subtle of the samples conditioned in spirits casks, the cup showed a very lively, delicate acidity, and the alcohol contribution was relatively integrated, with the coffee turning the rum contribution pleasingly Cabernet- or brandy-like. We also tested a handful of samples representing other approaches to aroma- or alcohol-conditioning. The Big Island Coffee Roasters’ Puna Theobroma Coffee (92) was scented with wild-harvested roasted cacao nibs. You can find the interesting backstory for this coffee, told by grower/roaster Kelleigh Stewart, here. The chocolate influence promoted a powerful yet delicately elegant cocoa-and-flowers character animating a pleasantly brisk, bittersweet structure. The process from cacao pod to bean and coffee cherry to cup. Photo by Kelleigh Stewart. All of the high-rated casked coffees we reviewed were conditioned in barrels that were dry at the point they were charged with coffee. In other words, there was no direct contact between beans and liquid; aroma did it all. We did test two samples, however, that were first infused with spirits before being put into casks for further conditioning. The exposure was even more direct with a new product from a prominent California winery, a tactfully darker-roasted coffee that was immersed in wine after roasting rather than before. None of these three samples was quite successful enough to break 90 in our view, though all suggested promise in regard to their basic processes. Will I Like These Coffees? A common theme in roaster communications on some of these coffees, both private and public, is that they are best enjoyed brewed when using methods, like French press or even espresso, that maximize weight and general intensity, and also that they are best enjoyed late in the day, with an afternoon pastry or an after-dinner dessert. Perhaps. I suppose the emphasis on afternoon or evening may, in part, reflect the discomfort some of us feel in consuming alcoholic beverages in the morning — although, of course, none of the cask-conditioned coffees contains any alcohol whatsoever. Furthermore, as I am aware whenever I attend weekend brunches, there are many among us who have never been much impressed by this no-alcohol-in-the-morning business. If I’m a Roaster, Should I Consider Experimenting with Cask-Conditioning? It seems clear that those roasters with whom I communicated carried out their casking experiments for the relatively disinterested reasons that still drive the leading edge of specialty coffee: a fundamental sense of adventure and a curiosity about the beverage and its potential. The devotion of specialty roasters to their craft was nowhere more apparent than among those roasters who regularly pulled samples from their casks and cupped them, trying to figure out the optimal moment to stop the casking. Or those who reported their detailed experiments with getting the roast profile right for these coffees, given their often shifting and shifty moisture contents. All of that care and experiment requires time and work, however, and it may also be worth noting that the first roaster I know of to experiment with cask conditioning, Ceremony Coffee Roasters, whose Mexico Santa Teresa BCS 02: Cabernet Franc Barrel we reviewed in 2013 at a rating of 95, no longer offers barrel-conditioned coffees, apparently because they have turned out to be a distraction from Ceremony’s main business. I hope that does not turn out to be the case with those adventurous roasters who sent us top-rated casked samples for this month’s report. Perhaps the spirit of open-ended innovation that seems to be driving this first wave of experiment with casking will gradually transform into that other, less dramatic, more lasting impulse animating the best side of specialty coffee: a passion for precise and consistent achievement.